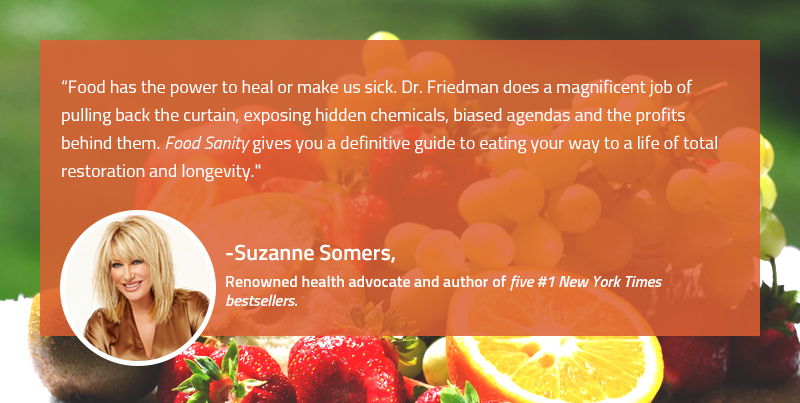 As health expert for Lifetime television’s morning show and syndicated radio host, Dr. Friedman has spent the last fifteen years interviewing hundreds of health advocates, scientists, doctors and New York Times bestselling authors. 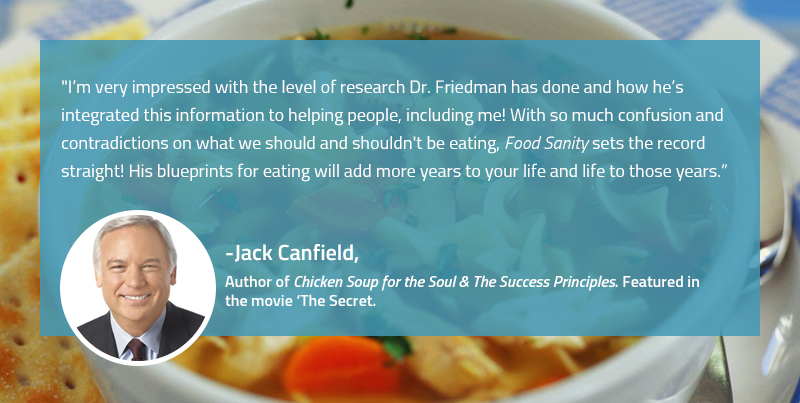 His goal has always been to share cutting-edge topics and advice to help his audience reach their optimal health. Unfortunately, that’s not what happened. Instead, every guest would end up leaving them (and Dr. Friedman) more and more confused. 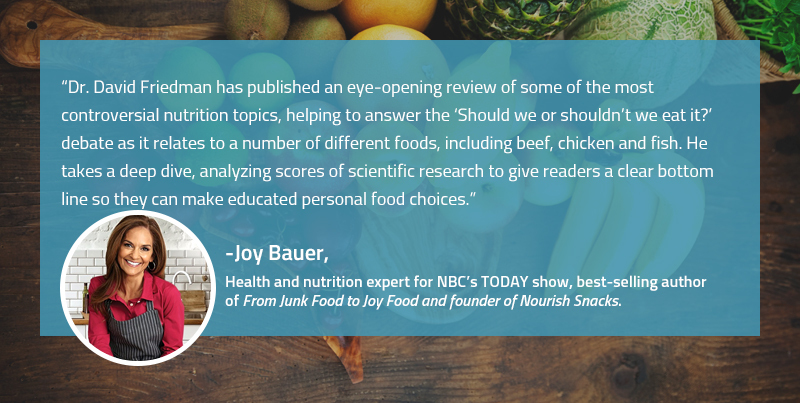 From proponents of a Vegan, Paleo, Mediterranean Diet to a Gluten Free and Low Carb Diet, the opinions are as different as night and day. 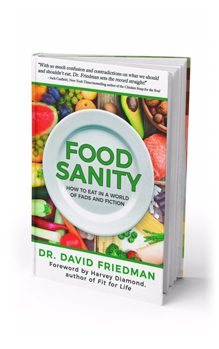 After becoming frustrated with so much biased (often paid for) and conflicting research, Dr. Friedman created a common science meets common sense approach that finally puts an end to the culinary conundrum! 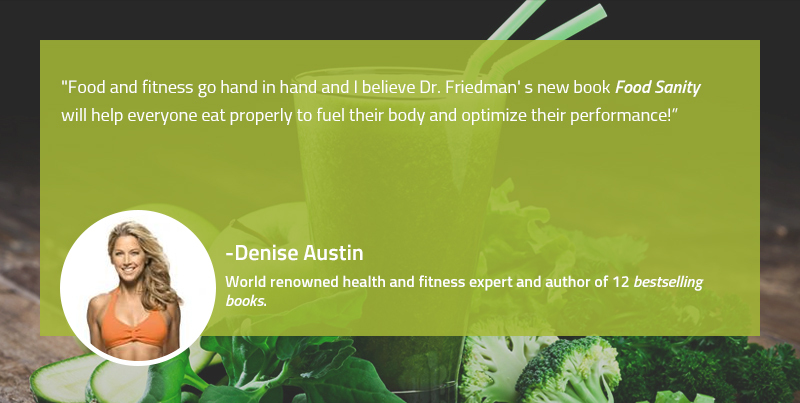 Dr. Friedman explores the Paleo Diet and Vegetarian Diet (pros and cons) and reveals forensic fossil evidence which shows what exactly our ancestors really ate. Dr. Friedman’s green, yellow, red light chart shows which fruits to eat in moderation (high in sugar and low in fiber) and which ones can be eaten with no limitations. Because of their toxic outer fat layer, if a pig is bitten by a rattlesnake, the snake is more likely to die than the pig! Dr. Friedman shows the best way to shop for pork and how to choose portions that are furthest away from the outer fat layer. Health experts say to limit fish consumption to twice a week because many varieties contain dangerous levels of mercury, a neurotoxin. Dr. Friedman reveals shocking evidence that naturally derived mercury found in fish is not a health concern. He explores cultures that eat fish daily (three times per day) whose blood tests show no mercury toxicity! Even pregnant females and their newborn children are not at risk from eating fish. Exercise stimulates hunger! Research from the Journal of Obesity found women who exercise eat two times more food than those that don’t exercise. When someone exercises, this causes them to crave more food, which in turn negates the weight-loss benefits of exercise. Food Sanity shares the three foods to eat prior to and after exercise that will help create weight loss. Seeing “all natural,” “hormone-free,” and “organic” on the label isn’t synonymous with being healthy. 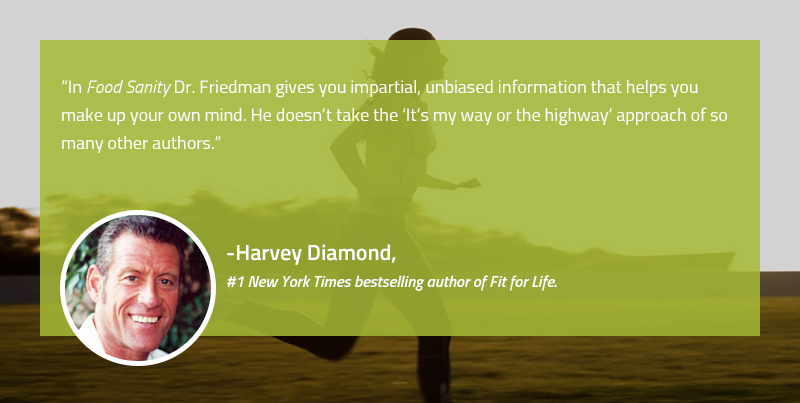 Dr. Friedman shares the truth behind how to read labels for accuracy. The numbers on the stickers you find on produce indicate how the product was grown: A 5-digit number beginning with 8 is a genetically modified food. Drinking cow’s milk is linked to osteoporosis, diabetes, and obesity and is not a good source of calcium or protein. Almond milk contains more calcium and protein than cow’s milk. Many vitamins and mineral supplements are created from the same toxic chemicals used to make nail polish, laundry detergent, paint, gasoline, and other industrial products. No wonder current research has shown Vitamin A causes lung cancer, Vitamin D causes DNA damage, and Vitamin D increases a person’s risk of stroke. 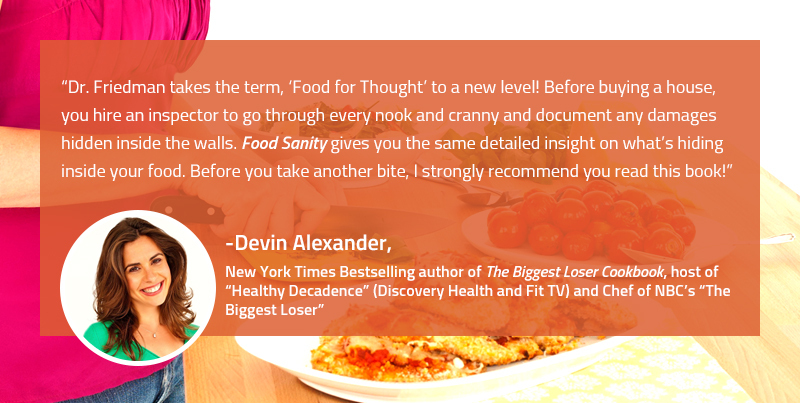 FOOD SANITY IS AVAILABLE EVERYWHERE BOOKS ARE SOLD!